The author of the Quick Quran Android app asked me to write an article about his creation, and I agreed in order to help promote his work and let more people benefit from it insha'Allah. Below is a screenshot of the app showing verse 26:10. By default, the app shows the Quran in an Arabic-English format. Three English translations are provided in the settings: Yusuf Ali, Hilali and Khan, and Sahih International. The above dialog comes up when you tap the microphone icon. The voice search actually has three options. 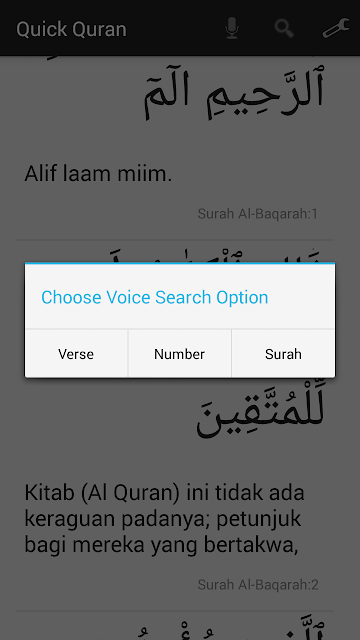 By tapping "Verse", you can recite a verse and it will find it for you (with 90% accuracy according to the developer). 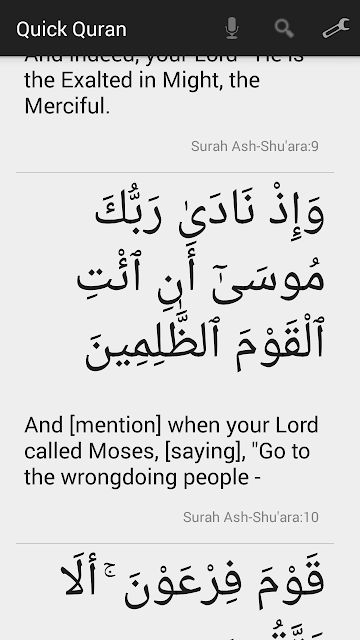 Tapping "Number" lets you say "chapter 5 verse 9" and it will take you to verse 9 of Surat al-Maa'idah. I am not sure what the "Surah" option does, as it does not work on my phone. The phone I am using is an Amazon Fire Phone, which runs FireOS, rather than pure Android, therefore there might be some compatibility issues that are preventing the app from working perfectly on my phone. One issue with the app is that it considers the basmalah (the phrase bismillahir rahmaanir raheem) at the start of each surah as part of the first verse of the surah, though this is only true for Surat al-Fatihah. 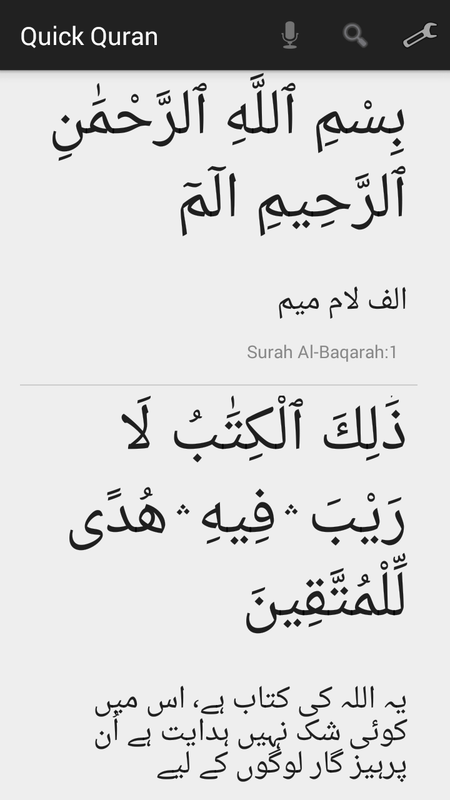 For the rest of the surahs, the basmalah should be shown separately from the first verse. The app treats Surat al-Tawbah (chapter 9) correctly, skipping the starting basmalah. 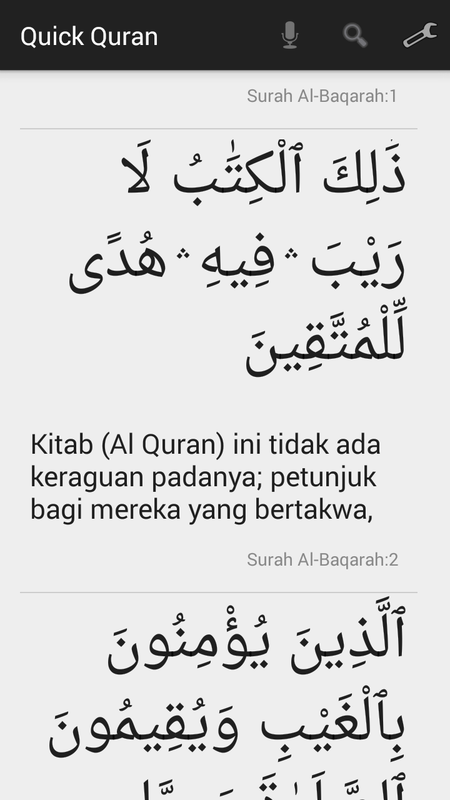 The Quick Quran app is a useful app and with future improvements, it has the potential to become one of the best Quran apps on the Play Store.